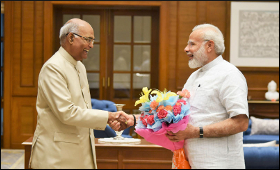 Playing the Dalit card, the BJP on Monday threw a surprise by nominating Bihar Governor Ram Nath Kovind as the NDA choice for the President's post, stunning the opposition which accused the ruling party of unilateralism. Bharatiya Janata Party President Amit Shah announced the name of Kovind, 71, after a nearly two-hour meeting of the BJP parliamentary board attended by Prime Minister Narendra Modi and others, ending all suspense about the NDA's candidature for the top constitutional post. Though the main opposition parties did not criticise Kovind, who emerged as a dark horse, they kept their cards close to the chest on whether they would back him. Barring the TRS and the BJD which expressed support to Kovind, all other non-BJP parties accused the ruling party of unilateralism and will meet here on Thursday to finalise their strategy for the July 17 battle. Union Minister M. Venkaiah Naidu insisted that all parties were consulted. On his part, the soft-spoken Kovind said he would appeal to all political parties and members of the electoral college to back him. "We have decided that Ram Nath Kovind will be the NDA Presidential candidate," Shah told the media, adding he was likely to file his nomination on Friday. Modi said Kovind would make an "exceptional" President and called him a strong voice for the poor and the marginalised communities. "With his illustrious background in the legal arena, Kovind's knowledge and understanding of the Constitution will benefit the nation." If elected, Kovind will be the second Dalit President after K.R. Narayanan. A former head of the BJP Dalit wing and a two-time Rajya Sabha member, the low-key Kovind, who hails from Kanpur in Uttar Pradesh, became the Bihar Governor after Modi stormed to power in May 2014. A sulking Shiv Sena chief Uddhav Thackeray disapproved of caste being the basis for Presidency. But another BJP ally, Ramvilas Paswan of the Lok Janshakti Party, said those who oppose Kovind will be considered anti-Dalit. BSP chief Mayawati, a Dalit leader herself, said Kovind cannot be opposed unless the opposition fielded a popular Dalit nominee. Bihar Chief Minister Nitish Kumar called on Kovind immediately after Shah's announcement. But he was non-committal on whether his Janata Dal-United will support Kovind. He said he congratulated Kovind on his nomination. "I am personally glad he is the presidential candidate." As to whether the JD-U will back his candidature, Nitish Kumar said: "It is difficult to say at this point of time. I had talks with (RJD chief) Lalu Prasad and (Congress President) Sonia Gandhi. We will discuss later and decide." Congress leader Ghulam Nabi Azad declined to go into the merits and demerits of Kovind and did not say whether or not the opposition will field a candidate. "All the opposition parties had collectively decided on evolving a consensus on the Presidential candidate when leaders of 18 parties met recently," he said. Sitaram Yechury of the CPI-M struck a different note. "Kovindji was the chief of the RSS Dalit branch. So somewhere it is a political fight or a contest. We are not commenting or giving any character certificate to anyone." He said the BJP leaders had promised to seek the opposition' consent on the Presidential candidate which did not happen. An advocate by profession, Kovind was a Rajya Sabha member for 12 years and a member of several parliamentary panels. He had practised law in both the High Court and the Supreme Court. An unassuming man, Kovind worked through the ranks to become a national spokesperson of the BJP. He headed the BJP's Dalit wing for three years from 1999.